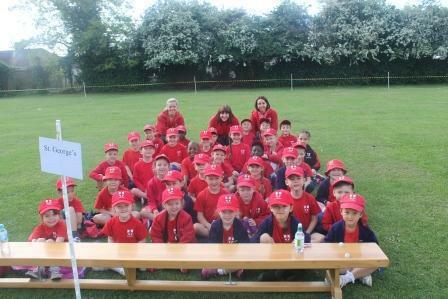 Children from Key Stage 1 represented the school at the Catholic Schools Cross Country event on 26th May. On 26th May a team of excited runners from St Francis, St Therese and St Elizabeth classes participated in the KS1 Deanery Cross Country event at St Teresa’s in Rochford and were magnificent! They didn’t quite know what to expect, as this was the first time the event had been organised, but all team members ran with energy, enthusiasm and eagerness to do their best. We had some individual successes: Holly & Charlie (St Elizabeth) both won their race and Casey (St Therese) came second. We also gained third place overall from the team points, which is a great achievement. Well done Team St George’s, we are proud of you all.